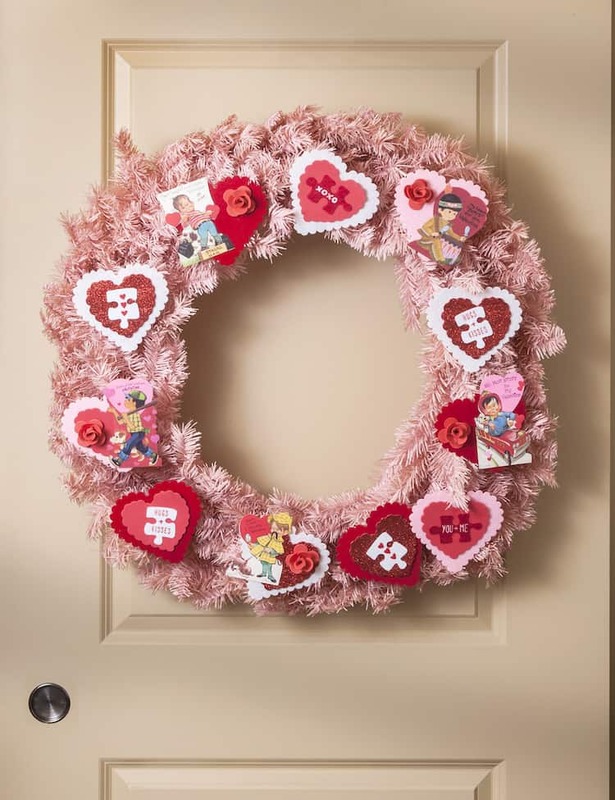 Home / Holiday Crafts / Valentine’s Day / Vintage Style Valentine Wreath in 15 Minutes! 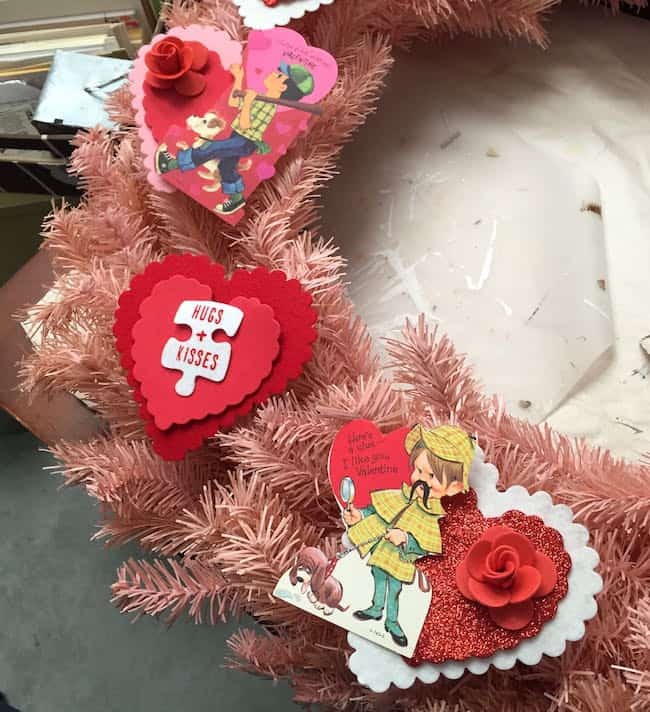 Vintage Style Valentine Wreath in 15 Minutes! 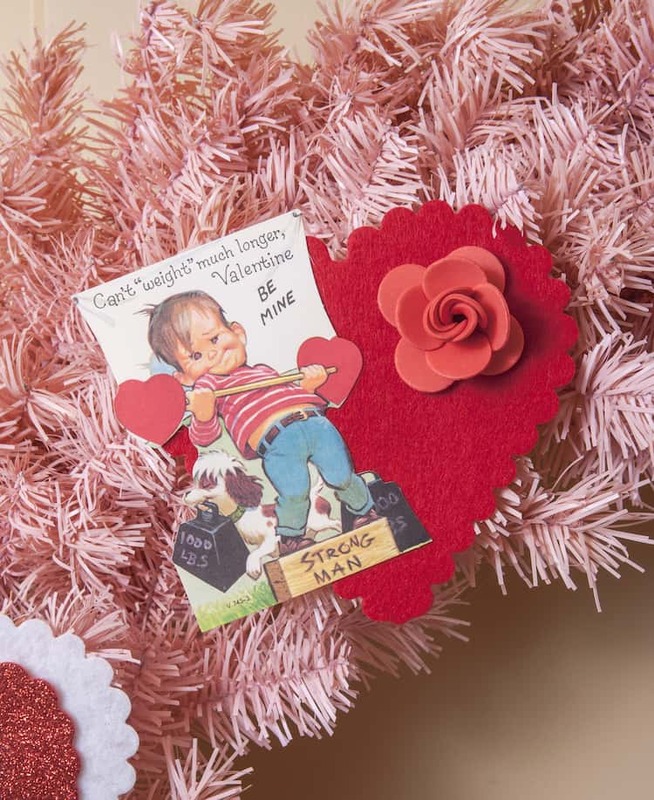 Use vintage valentines, a few supplies, and a pink form to make this unique valentine wreath in 15 minutes. Easy enough for kids and adults! 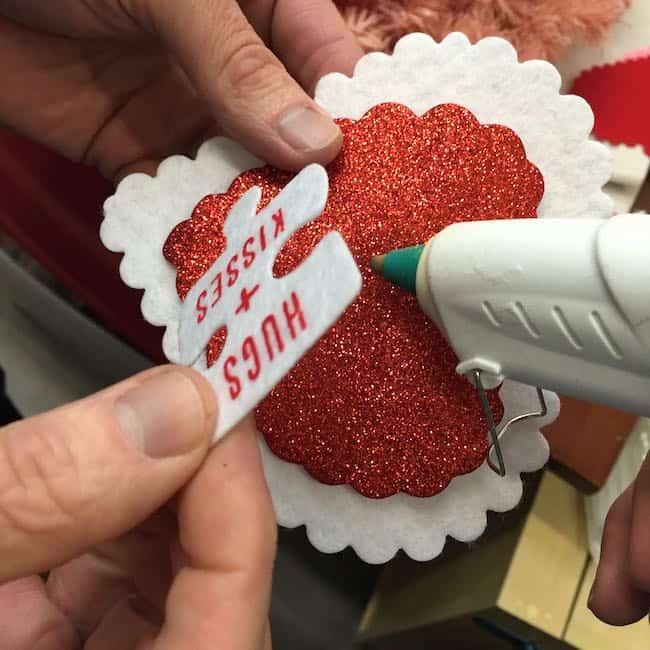 It’s always fascinating to get one item to decorate and see what a bunch of individuals come up with – don’t you think? Well, I’m participating in a blog hop for Treetopia . 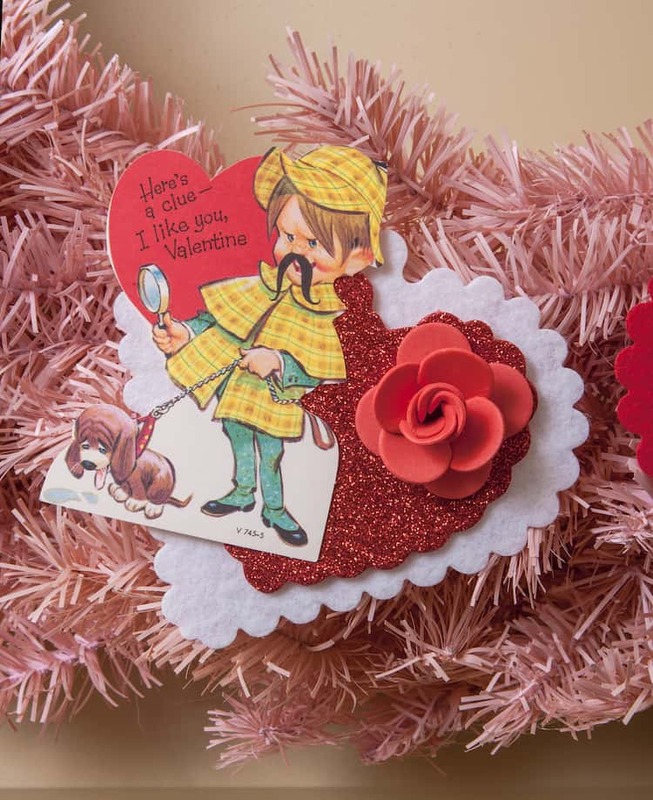 . . and I’m so excited to share with you my 15 minute vintage valentine wreath! 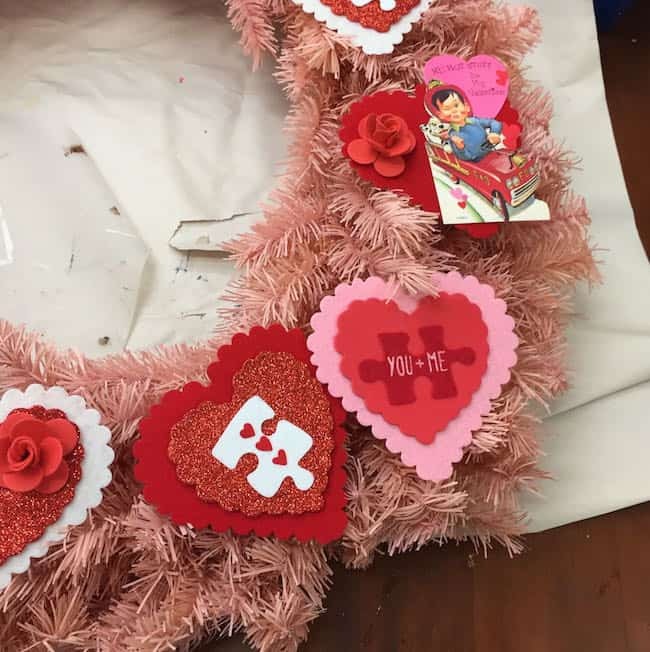 Me and a few other bloggers/designers got an AMAZING pink wreath base and were challenged to decorate it any way we like – so I chose to go with vintage valentines, felt/foam hearts, and a lot of hot glue. I will show you how quick it was to make! One more thing: you know when a project is in your mind and it goes down perfectly on paper? That happened here. I’m just as pleased with it in real life as I was in my head. Don’t you love that? 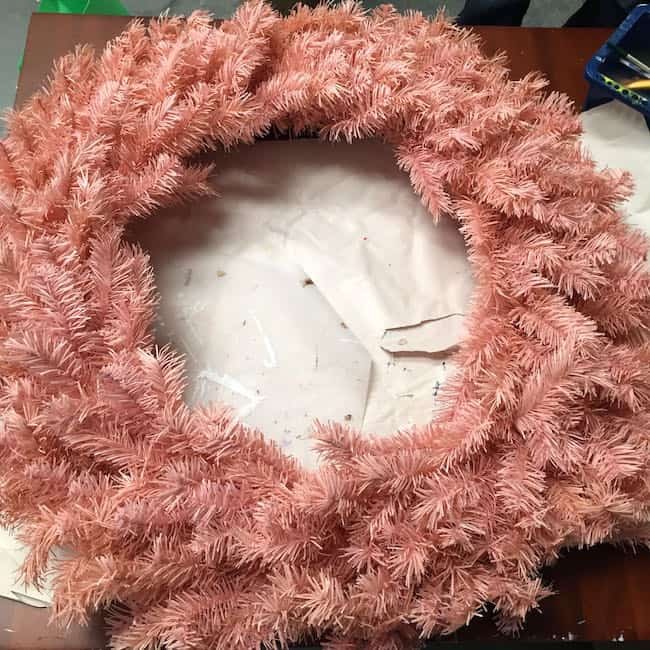 There’s nothing like pulling a 36″ wreath out of a box! Especially when it’s pink. 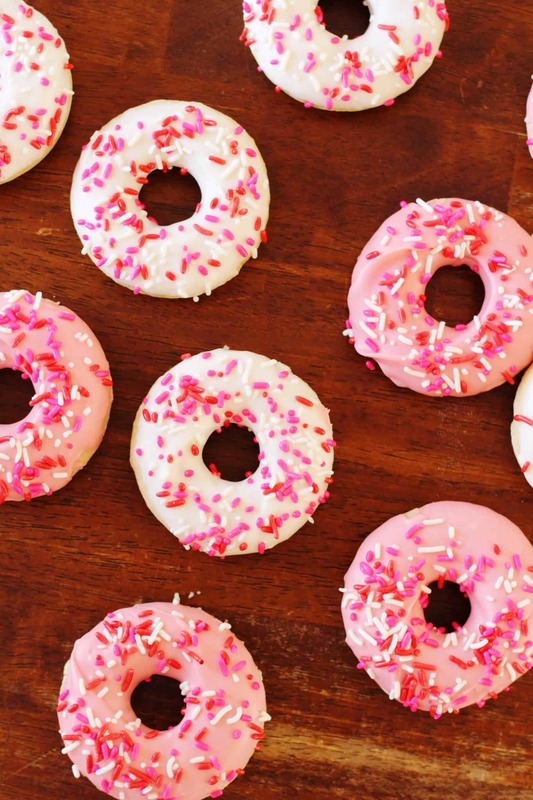 I love pink wreaths. 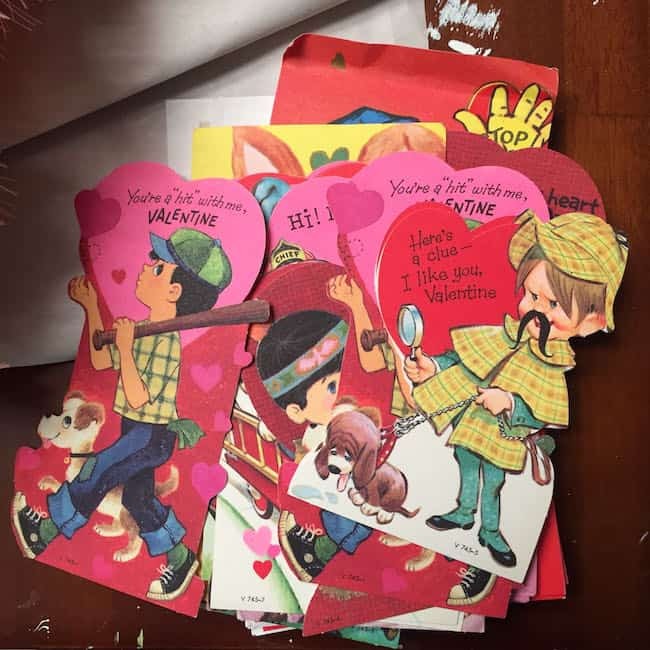 I knew that I wanted to have a vintage feel to my wreath, so I ordered several vintage valentines on eBay. They were inexpensive. 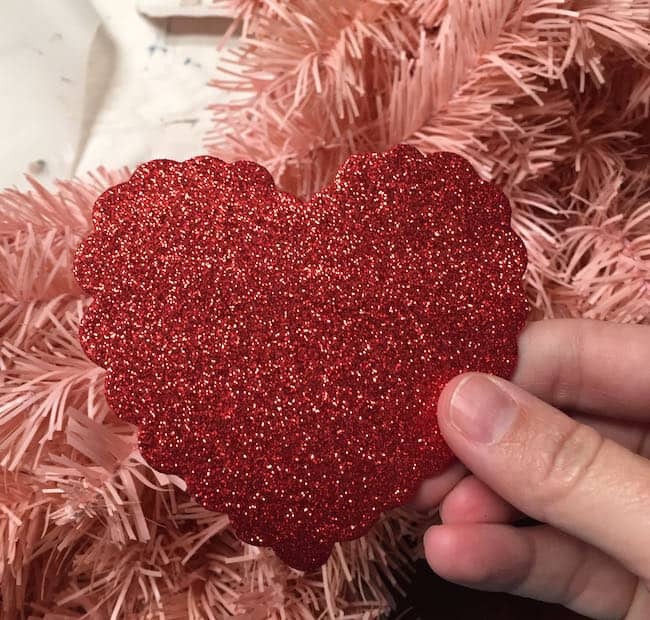 I started with some large felt hearts . . .
. . . and then I had the glittered ones as well. I figured out what I wanted to do with my wreath by experimenting, and that was layering. 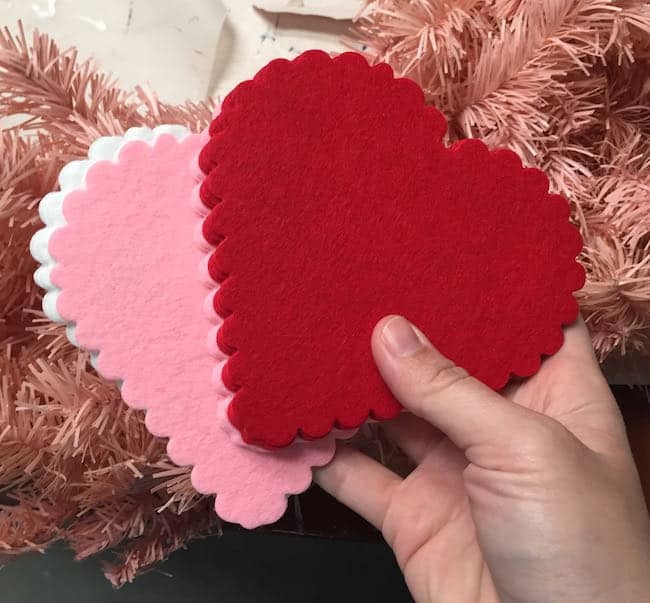 After putting a few flowers onto hearts and then standing back a bit, I realized I wanted to layer felt, vintage valentines, and flowers! I also had some cute puzzle pieces to play with too. I layered and worked my way around the wreath. 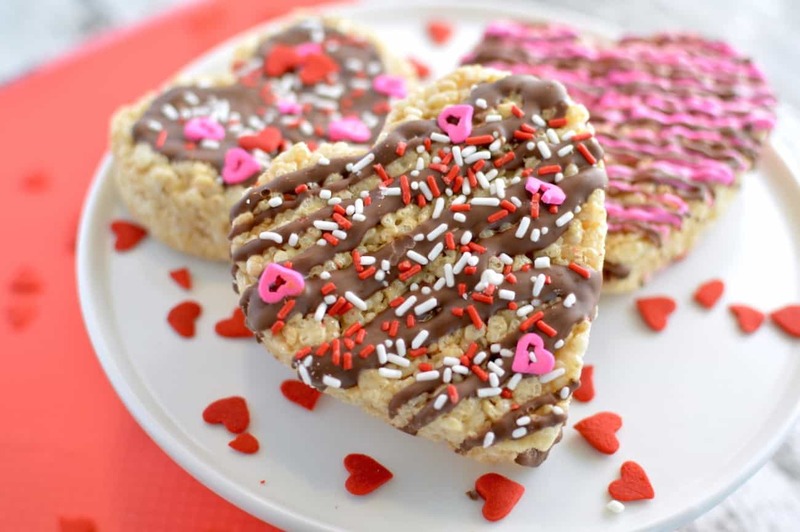 Then I stood back and switched out some hearts and colors to float my boat. 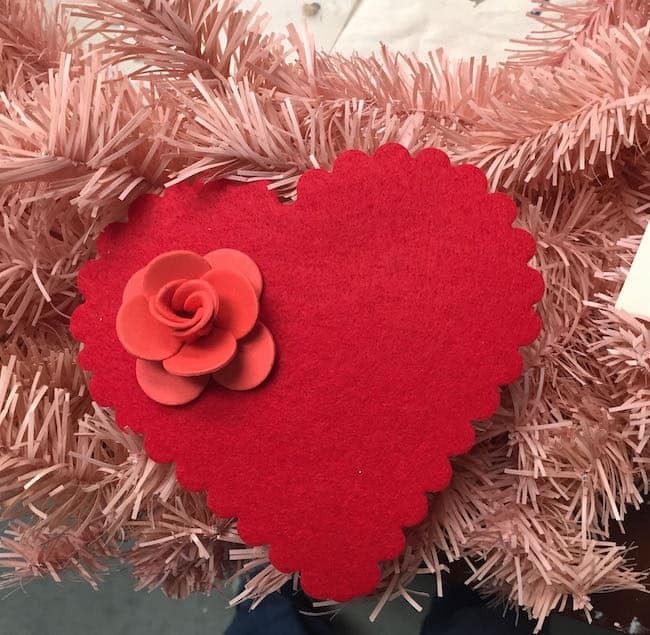 Once I had everything in the right place, I secured all of my hearts, valentines, flowers, and other embellishments down with my hot glue gun. Then to adhere them to the wreath, I bent a branch a little bit and hot glued right to it. 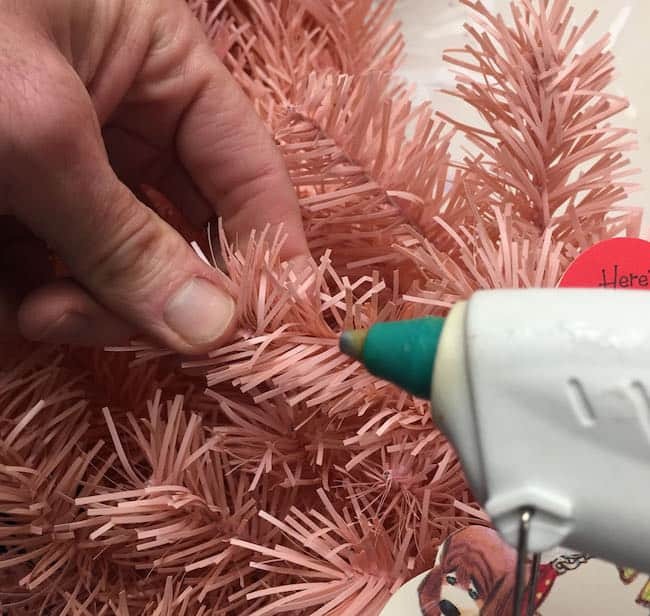 I repeated all the way around the wreath until my hot gluing was complete! This was seriously easy and only took about 15 minutes – can you imagine what it would have taken had I been a little bit more decisive? Oh my, that’s super adorable! So cute! I love the vintage Valentines! 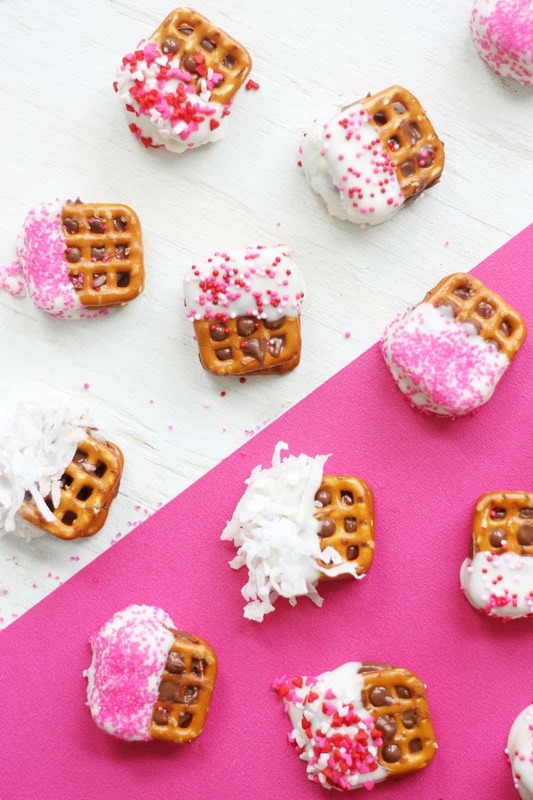 This is such a fun wreath! I love what you did with it. Pinned! So much fun! I love vintage stationery. I always loved getting balloons and flowers all through my school years! I miss those days. Cute! I have a lot of old Valentine’s Day cards so this would be super simple to put together. Love this – soooo pretty!! 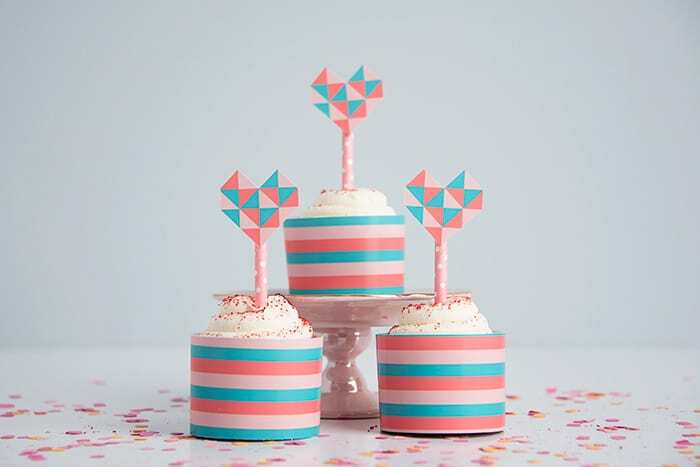 Vintage and pink, love it! What a great idea! I love the vintage vibe! I like that after 32 years, ANY day can be a Valentine day!